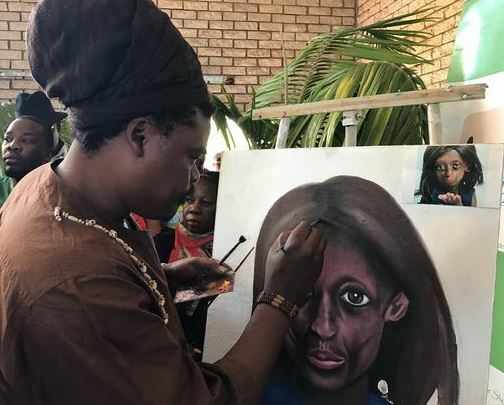 Zimbabwean artist Libani Sirenje painted a stunning portrait of Ontlametse at her memorial service today. Ontlametse Phalatse was the only black female in South Africa diagnosed with progeria, a rare disease that causes children to age rapidly. Phalatse was known for her courageous spirit and her determination to live her life despite the debilitating disease. Last month she paid a special visit to President Jacob Zuma at his Mahlamba Ndlopfu Presidential House in the Bryntirion Estate in Pretoria. Below are some of the best moments at her memorial service which took place on Wednesday. #OntlametseMemorial it is not a matter of duration its all about impact. She played her role and generation to come will know her.